1Nano Chemical Eng. Dep., Faculty of Advanced Technologies, Shiraz University, Shiraz, Iran. 2Nano Chemical Eng. Dep., International Division, Shiraz University, Shiraz, Iran. In this study, considering the importance of protecting the environment and preventing the pollution caused by industrial plants, a nanocomposite each component thereof is capable of removing the desired combination to solve this problem has been produced. To achieve this goal, ZnO/SnO2nanocomposite was synthesized using the co-precipitation method. The characterization of this nanocomposite was conducted by DLS, XRD, FTIR and SEM. The nanocomposite size was about 15nm. Several parameters such as the initial concentration of the wastewater, as well as the amount of catalyst and time were investigated. The reduction of the particle size due to an increase in the surface area of​​ the nanocomposite increased the amount of decolorization. For all the performed experiments, the dye removal rate was 100% and the difference was to do with the time of the complete removal of methylene blue. A decrease in the concentration of methylene blue in the range of the tested concentrations reduced the decolorization, and by increasing the amount of nanocomposite in the range of the tested values, a decline in decolorization was observed. The generated hydroxyl radicals react with organic pollutants and change most of them in combinations such as water, carbon dioxide and inorganic acids . Numerous studies have to do with improving the photocatalytic efficiency of the semiconductor photocatalysis by reducing the combination rate of the photogenerated electron-hole (e-/h+) pairs and increasing the charge separation . Fortunately, connecting two semiconductors with different band gap widths can increase the charge separation and extend the energy range of the photoexcitation. Hence,the photocatalysis of the coupled semiconductors, such as ZnO/WO3 [8, 9], SnO2/TiO2 [10, 11], TiO2/PbS  ZnO/TiO2/SnO2  and so forth has shown higher photocatalytic activity for the reaction of both liquid and gas phases than that of the single semiconductors. The earlier researches on the photocatalytic activity of the ZnO/SnO2 systems under UV light (at the Zn/Sn molar ratios; 1:1 and 1:0.5) prepared by the co-precipitation methods were reported by Shen et al. . However, it is known that the photocatalytic activity of SnO2 is much lower than that of the pure ZnO and the coupled ZnO/SnO2 . In addition, the screening of the photocatalysts under solar light is also a crucial factor which the present work has carried out with this aim. In this study, the nanocomposites ZnO/SnO2 photocatalysts were prepared by the co-precipitation method . The characterization of the nanocomposites ZnO/SnO2 photocatalysts was done by DLS, XRD, FTIR, and SEM. The photocatalytic activity of the sample was evaluated by the degradation of methylene blue under natural solar light. Methylene blue is a chemical aromatic and important dye commonly used in textile industry. Because of its aromatic property, this dye tends to be toxic, resistant to biodegradation, cancer-causing and mutagenic [15-17]. Nanocomposites ZnO/SnO2 photocatalysts were synthesized using the co-precipitation method. Zinc sulfate heptahydrate (ZnSO4.7H2O, Merck) and tin chloride pentahydrate (SnCl4.5H2O, Sigma-Aldrich) were used as the starting materials, and ammonium hydroxide solution (NH4OH, 25%, Merck) was used as a co-precipitant without further purification. ZnSO4.7H2O and SnCl4.5H2O at a certain molar ratio were dissolved in 1 liter of deionized water and magnetically stirred in a dropwise and slow manner at a rate of up to 30 seconds in the NH4OH (25%) solution to maintain the pH of the solution at 7. During the reaction, the color of solution was milky white and the white amorphous precipitate was slowly formed. The resultant solution was stirred constantly for 30 minutes. The obtained precipitates were centrifuged and washed three times with deionized water until no and were found in the filtrates. The removal ofand ions was confirmed by comparing the conductivity of the filtrates to that of the fresh ultrapure water used for the washing . Then the wet precipitate was dried at in air for 12 h to form the precursors of the coupled ZnO/SnO2 photocatalysts. At last the precursors were calcined at for 2 h at a rate of in air to prepare the nanosized photocatalysts. The nanosized ZnO (Z) and SnO2 (S) were also prepared by the same procedure as mentioned above. The Horiba LB-550 particle size analyzer (PSA) uses dynamic light scattering (DLS) measurements to measure the particle size over the range of 0.001–6 μm. whereis the mean grain size (nm), λ is the wavelength of the X-ray radiation (1.5406 Å), β is the corrected full-width at half maximum (FWHM in radian) and θ is the diffraction angle (degree). The UV-Vis diffuse reflectance spectra (UV-Vis DRS) were carried out in air at room temperature using the SHIMADZU UV-1800 UV–V spectrophotometer to achieve a resolution of 1 nm. The infrared spectra (IR) were obtained using a Perkin Elmer RX I Fourier transform infrared (FTIR) spectrometer. The scanning electron microscopy observation (SEM) was performed using Perkin Elmer EM 3200 SEM. The photodegradation of methylene blue in the aqueous solution was performed in the presence of the 0.33, 0.50, 0.66 and 0.83 g amounts of ZnO/SnO2 photocatalysts. In this study, the synthetic wastewater with the distilled water contaminated by methylene blue at the concentrations of 10, 15, 20 and 30 mg/L was used. All the photocatalytic experiments were performed in a batch photocatalytic reactor and in each experiment, 500 ml of wastewater was poured inside the reactor at first and then the ZnO/SnO2 photocatalysts were weighed precisely and added to the solution and at the next step were ultrasonically sonicated for 15 min. The suspensions were magnetically stirred in the dark for 90 min to ensure an adsorption/desorption equilibrium . The reaction was started by putting the reactor under solar light and turning on the magnetic stirrer. The dispersion was sampled after various reaction times and the analytical samples were centrifuged at 9000 rpm for 10 min, and then filtered through a 0.2 millipore filter to remove the particles . The MB concentrations of the filtrates were analyzed by UV-Vis spectroscopy. The particle size distribution by the DLS measurement of the ZnO/SnO2 photocatalysts nanoparticles has been shown in Fig. 1. The average size of the coupled ZnO/SnO2 photocatalysts is about 15 nm. Fig. 2 shows the XRD pattern of the coupled ZnO/SnO2 photocatalysts. This diagram is similar to the XRD spectrum of the synthesized ZnO/SnO2 nanocomposite by Hamrouni et al. . The structure of ZnO and SnO2 in the sample has been identified as the typical hexagonal wurtzite [JCPDS No. 89-11397] and tetragonal structure [JCPDS No. 41-1445], respectively. The crystal planes are (1 0 1) and (1 1 0) for ZnO and SnO2, respectively. The mean grain size of ZnO is always found larger than that of SnO2, but the addition of SnO2 and ZnO to each other reduces remarkably their mean grain size and the SnO2 and ZnO particles prevent each other’s growth . The SEM micrographs of the ZnO/SnO2 photocatalysts have been shown in Fig. 3. The coupled ZnO/SnO2 photocatalyst is almost in the plate-like form. Fig. 4 illustrates the FTIR spectra of the coupled ZnO/SnO2 photocatalysts. As indicated in Fig. 4, the ZnO/SnO2 spectrum absorption peak at 625 is to do with the Sn-O stretching vibration and the one at 464 belongs to the ZnO . The peaks at 1173, 1221 and 3443 cm−1 correspond to O-H bending and stretching vibrations . Fig. 1. The particle size distribution of the ZnO/SnO2 photocatalysts nanoparticles. Fig. 2. The XRD patterns of the coupled ZnO/SnO2 photocatalysts (the lines and dots show ZnO and SnO2, respectively). Fig. 3. The SEM image of the coupled ZnO/SnO2 photocatalysts. Fig. 4.The FTIR spectra of the ZnO/SnO2nanocomposites. whereis the initial dye concentration and C is the dye concentration at time t. According to the previous studies , the photocatalytic decolorization of methylene blue follows the pseudo-first-order kinetic model. Fig. 5 shows the time-dependent UV-Vis spectra of 20 mg/L of methylene blue and 0.5 g of ZnO/SnO2 nanocomposite during the irradiation. As can be seen, the absorption peak at 663 nm, corresponding to the dye, diminished and finally disappeared during reaction, which indicated that the dyes had been degraded. The 10, 15, 20 and 30 mg/L concentrations of methylene blue tested by certain amounts of ZnO/SnO2 photocatalysts have been illustrated in Figs. 6 to 9. Experimental results show that the dye removal ratio is 100% at all methylene blue concentrations. However, by reducing the methylene blue concentration, the dye is removed in less time. The reason for the reduced dye in the photocatalytic process is the chemical reactions 5 to 13, showing the mechanism of the photocatalytic decolorization of methylene blue according to an earlier investigation . It is generally considered that by increasing the dye concentrations to a certain level, the degradation rate increases and by further increasing the dye concentration, the degradation rate of the dye is decreased. The degradation rate relates to the possibility ofradicals formation on the catalyst surface and to the possibility of the radicals reacting with the dye molecules. Therefore, by increasing the initial concentrations of the dye, the probability of the reaction between the dye molecules and the oxidizing species is increased, leading to an enhancement in the decolorization rate. In contrast, by further increasing the dye concentration,the dye degradation efficiency decreases . The probable reason is that at high dye concentrations, the active sites are covered with dye ions and therefore the generation of radicals on the surface is decreased. Another reason is the UV-screening effect of the dye itself . Also, the number of hydroxyl radicals produced remains stable by increasing the dye concentration and by fixing the concentration of the catalyst and irradiation, thereby decreasing the decolorization rate. In addition, the intermediate products formed by the degradation of dye are increased by increasing the initial dye concentration and therefore there is the possibility of the competing of the intermediate products with the dye molecules to degradation [23-25]. As can be seen, that less the dye decolorization time is, the less the concentration will be in 10 mg/L methylene blue. Fig. 5. The absorbance spectra changes of the 20 mg/L MB solution in the presence of 0.5 g ZnO/SnO2 and irradiation. Fig. 6.The effect of 10, 15, 20 and 30 mg/L concentrations of methylene blue in the presence of 0.33 g ZnO/SnO2 nanpcomposite. Fig. 7.The effect of 10, 15, 20 and 30 mg/L concentrations of methylene blue in the presence of 0.50 g ZnO/SnO2 nanpcomposite. Fig. 8.The effect of 10, 15, 20 and 30 mg/L concentrations of methylene blue in the presence of 0.66 g ZnO/SnO2 nanpcomposite. Fig. 9.The effect of 10, 15, 20 and 30 mg/L concentrations of methylene blue in the presence of 0.83 g ZnO/SnO2 nanpcomposite. Another result is that methylene blue is reduced at 15, 20 and 30 mg/L concentrations by 100 min. In the other words, the percentage of increasing the dye removal from wastewater is low and negligible after 100 min. The reason for a rapid increase in decolorization at the initial times and then the fixing of it for a long time is that at the beginning the amount of dye is high but by the progressing of reaction the amount of dye becomes low. For these reasons, 100 min is used as the optimum time for the above experiments. The 0.33, 0.50, 0.66 and 0.83 g amounts of coupled ZnO/SnO2 photocatalys tstested at certain concentrations of methylene blue have been shown in Figs. 10 to 13. As can be seen, the less the dye decolorization time is,the more the amount of nanocomposite, will be in 0.83 g of ZnO/SnO2. That is, the amounts of decolorization increase by increasing the surface area of the catalyst . According to the experimental results, 0.66 g of the ZnO/SnO2 nanocomposite due to its following related changes and the resulting affordability was selected as the optimum amount in the presence of 15, 20 and 30 mg/L methylene blue concentrations. Figs. 14 illustrates the color of the solution in decolorization in 10 mg/L of methylene blue in the presence of 0.83 g of the ZnO/SnO2 nanocompositeat different times. It can be observed that after different times, the color of the solution began fading away and finally disappeared. Fig. 10.The effect of 0.33, 0.50, 0.66 and 0.83 g amounts of ZnO/SnO2 nanocomposite in the presence of 10 mg/Lmethylene blue. Fig. 11.The effect of 0.33, 0.50, 0.66 and 0.83 g amounts of ZnO/SnO2 nanocomposite in the presence of 15 mg/Lmethylene blue. Fig. 12.The effect of 0.33, 0.50, 0.66 and 0.83 g amounts of ZnO/SnO2 nanocomposite in the presence of 20 mg/Lmethylene blue. Fig. 13.The effect of 0.33, 0.50, 0.66 and 0.83 g amounts of ZnO/SnO2 nanpcomposite in the presence of 30 mg/Lmethylene blue. Fig. 14. From left to right, the color of the sample before being put under solar light, after 15, 25 and 50 min under solar light, respectively. 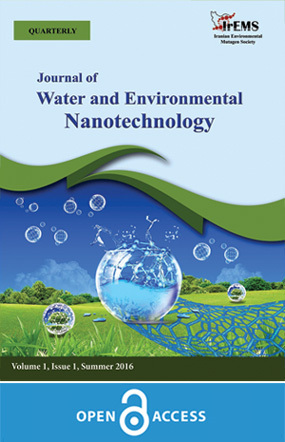 In this study, the photocatalytic removal of the dye pollutions from the wastewater by the ZnO/SnO2 nanocomposite was investigated. The effect of various parameters such as the amount of photocatalyst, reaction time, concentration of the pollutant in the wastewater was tested. The results showed that by increasing the surface area the particle size of the nanocomposite is reduced, leading to an increase in the amount of decolorization. A reductionin the concentration of methylene blue in the range of the tested concentrations reduced the time decolorization. The decolorization time was decreased by increasing the amount of ZnO/SnO2 nanocomposite in the range of the tested values. 0.66 g was the optimum of the ZnO/SnO2 nanocomposite in the empirical tests conducted in 15, 20 and 30 mg/L of methylene blue. The optimum time of the tests in 15, 20 and 30 mg/L of methylene blue was 100 min. 1. Kuzhalosai, V., B. Subash, A. Senthilraja, P. Dhatshanamurthi and M. Shanthi, 2013. Synthesis, Characterization and Photocatalytic Properties of SnO2–ZnO Composite under UV-A Light. Spectrochimica Acta Part A: Molecular and Biomolecular Spectroscopy, 115(1): 876-882. 2. Hamrouni, A., H. Lachheb and A. Houas, 2013. Synthesis, Characterization and Photocatalytic Activity of ZnO-SnO2 Nanocomposites. Materials Science and Engineering: B, 178(20): 1371-1379. 3. Thiruvenkatachari, R., S. Vigneswaran and S. Moon, 2008. A Review on UV/TiO2 Photocatalytic Oxidation Process. Korean Journal of Chemical Engineering, 25(1): 64-72. 4. Mai, F.D., C.C. Chen, J.L. Chen and S.C. Liu, 2008. Photodegradation of Methyl Green Using Visible Irradiation in ZnO Suspensions Determination of the Reaction Pathway and Identification of Intermediates by a High-Performance Liquid Chromatography–Photodiode Array-Electrospray Ionization-Mass Spectrometry Method. Journal of Chromatography A, 1189(1): 355-365. 5. Yang, Z., L. Lv, Y. Dai, Z. Xv and D. Qian, 2010. Synthesis of ZnO–SnO2 Composite Oxides by CTAB-Assisted Co-precipitation and Photocatalytic Properties. Applied Surface Science, 256(9): 2898-2902. 6. Houas, A., H. Lachheb, M. Ksibi, E. Elaloui, C. Guillard and J-M. Herrmann, 2001. Photocatalytic Degradation Pathway of Methylene Blue in Water. Applied Catalysis B: Environmental, 31(2): 145-157. 7. Lin, C-C and Y-J. Chiang, 2012. Feasibility of Using a Rotating Packed Bed in Preparing Coupled ZnO/SnO2 Photocatalysts. Journal of Industrial and Engineering Chemistry, 18(4): 1233-1236. 8. Li, D., H. Haneda, N. Ohashi, S. Hishita and Y. Yoshikawa, 2004. Synthesis of Nanosized Nitrogen-Containing MOx–ZnO (M = W, V, Fe) Composite Powders by Spray Pyrolysis and Their Visible-Light-Driven Photocatalysis in Gas-Phase Acetaldehyde Decomposition. Catalysis Today, 93-95(1): 895-901. 9. Li, D and H. Haneda, 2003. Photocatalysis of Sprayed Nitrogen-Containing Fe2O3–ZnO and WO3–ZnO Composite Powders in Gas-Phase Acetaldehyde Decomposition. Journal of Photochemistry and Photobiology A: Chemistry, 160(3): 203-212. 10. Yang, J., D. Li, X. Wang, X. Yang, and L. Lu, 2002. Rapid Synthesis of Nanocrystalline TiO2/SnO2 Binary Oxides and Their Photoinduced Decomposition of Methyl Orange. Journal of Solid State Chemistry, 165(1): 193-198. 11. Shi, L., C. Li, H. Gu and D. Fang, 2000. Morphology and Properties of Ultrafine SnO2-TiO2 Coupled Semiconductor Particles. Materials Chemistry and Physics, 62(1): 62-67. 12. Ratanatawanate, C., Y. Tao and K.J. Balkus, 2009. Photocatalytic Activity of PbS Quantum Dot/TiO2 Nanotube Composites. Journal of Physical Chemistry C, 113(24): 10755-10760. 13. Wang, C., B-Q. Xu, X. Wang and J. Zhao, 2005. Preparation and Photocatalytic Activity of ZnO/TiO2/SnO2 Mixture. Journal of Solid State Chemistry, 178(11): 3500-3506. 14. Cun, W., Z. Jincai, W. Xinming, M. Bixian, S. Guoying, P. Ping’an and F. Jiamo, 2002. Preparation, Characterization and Photocatalytic Activity of Nano-Sized ZnO/SnO2 Coupled Photocatalysts. Applied Catalysis B: Environmental, 39(3): 269-279. 15. Lucas, M.S and J.A. Peres, 2007. Degradation of Reactive Black 5 by Fenton/UV-C and Ferrioxalate/H2O2/Solar Light Processes. Dyes and Pigments, 74(3): 622-629. 16. Aksu, Z., 2005. Application of Biosorption for the Removal of Organic Pollutants: A Review. Process Biochemistry, 40(3-4): 997-1026. 17. Somasiri, W., X-F. Li, W-Q. Ruan and C. Jian, 2008. Evaluation of the Efficacy of Upflow Anaerobic Sludge Blanket Reactor in Removal of Colour and Reduction of COD in Real Textile Wastewater. Bioresource Technology, 99(9): 3692-3699. 18. Wang, C., X. Wang, B-Q. Xu, J. Zhao, B. Mai, P. Peng, G. Sheng and J. Fu, 2004. Enhanced Photocatalytic Performance of Nanosized Coupled ZnO/SnO2 Photocatalysts for Methyl Orange Degradation. Journal of Photochemistry and Photobiology A: Chemistry, 168(1-2): 47-52. 19. Mihaiu, S., I. Atkinson, O. Mocioiu, A. Toader, E. Tenea and M. Zaharescu, 2011. Phase Formation Mechanism in the ZnO-SnO2 Binary System. Roumanian Journal of Chemistry, 56(5), 465-472. 20. Sandesh, S., G.V. Shanbhag and A.B. Halgeri, 2014. Zinc Hydroxystannate: A Promising Solid Acid–Base Bifunctional Catalyst. The Royal Society of Chemistry, 4(2): 974-977. 21. Kartal, Ö.E., M. Erol and H. Oguz, 2001. Photocatalytic Destruction of Phenol by TiO2 Powders. Chemical Engineering & Technology, 24(6): 645-649. 22. Konstantinou, I.K and T.A. Albanis, 2004. TiO2-Assisted Photocatalytic Degradation of Azo Dyes in Aqueous Solution: Kinetic and Mechanistic Investigations: A Review. Applied Catalysis B: Environmental, 49(1): 1-14. 23. Mahmoudi, N.M., K.H. Rayat Tari, S. Borhani, M. Arami and F. Nourmohammadian, 2008. Decolorization of Colored Wastewater Containing Azo Acid Dye Using Photo-Fenton Process: Operational Parameters and a Comparative Study. Journal of Color Science and Technology, 2(1): 23-29. 24. Mahmoudi, N.M., M. Arami, K.A.D. Gharanjig and F. Nourmohammadian, 2007. Decolorization and Mineralization of Basic Dye Using Nanophotocatalysis: Pilot Scale Study. Journal of Color Science and Technology, 1(1): 1-6. 25. Daneshvar, N., M.A. Behnajady and Y. Zorriyeh Asghar, 2007. Photooxidative Degradation of 4-Nitrophenol (4-NP) in UV/H2O2 Process: Influence of Operational Parameters and Reaction Mechanism. Journal of Hazardous Materials, 139(2): 275-279. 26. Kansal, S.K., M. Singh and D. Sud, 2007. Studies on Photodegradation of Two Commercial Dyes in Aqueous Phase Using Different Photocatalysts, 141(3): 581-590.